Individuals with acne scars might be left with embarrassing blemishes on their skin. Scars can be difficult to hide and unfortunately, make-up cannot disguise deep acne scars. In order to completely cover up acne scars, an individual is required to go through an in-office procedure. 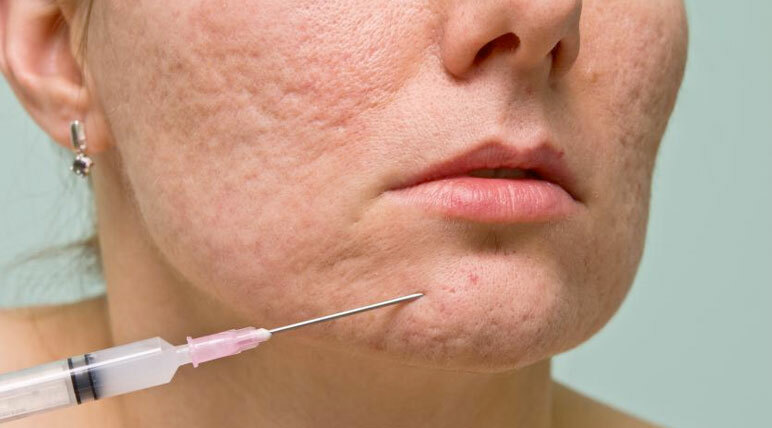 Acne scar patients can now restore their natural, beautiful skin with PRP or Platelet-Rich Plasma. PRP utilizes your body’s own blood platelets to rejuvenate healthy skin without the need for surgery. Upon arrival to your appointment, your blood will be taken by a licensed health care provider. The quantity of blood will vary as it is reliant on the amount of acne scars and blemishes on your skin requiring treatment. Within a matter of minutes, the blood gets converted into PRFM by the centrifugation system. When the conversion is completed, the PRFM is carefully injected into the treatment location. The entire process can take roughly 30 minutes. You may notice some minor swelling in the skin after treatment, however this will cause no downtime. You may continue your regular routines without interruption. You will see complete results of your treatment within a few weeks.